St. John, USVI is an unspoiled island located in the Caribbean ocean. 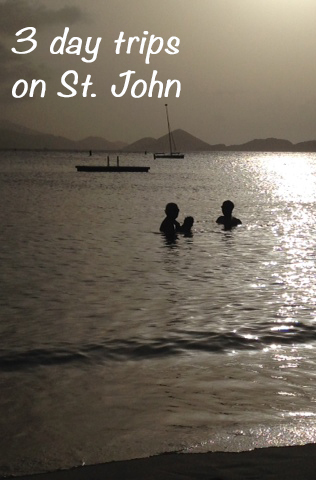 On our family vacation there this summer, we discovered that not only is St. John beautiful and very family friendly, there are numerous activities to partake in. Although spending all day every day on the beach was tempting, we wanted to make an effort to do something outside of the resort. We set out to find 3 day trips on St. John and we weren’t disappointed. A jeep ride and lunch at Skinny Legs: Renting a jeep on St. John is a popular activity and there are several places to rent from. We had the option to rent through our hotel but found that looking in town got us a better rate. 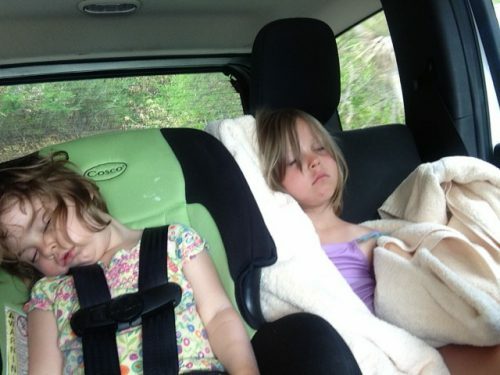 We decided on Varlack Car Rentals and saved a bundle. The cars were clean and roomy, with more than enough room for all 9 of us decided between two jeeps. We cruised around the island to check it out and settled in a Skinny Legs for lunch. Skinny Legs has been around for over ten years and is a fun, open air restaurant on the quieter side of the island. Basic food, basic drinks and a great atmosphere, especially for families. It’s loud and open and casual and no one cares if kids are running around. In the back of the restaurant is a huge sandy area, perfect for a large family to hang out. The Baths of Virgin Gorda: The Baths are in the Bristish Virgin Islands so the whole family will need a passport for this outing. There are several charters that can take you over for the day, and most of the hotels can arrange everything for you. 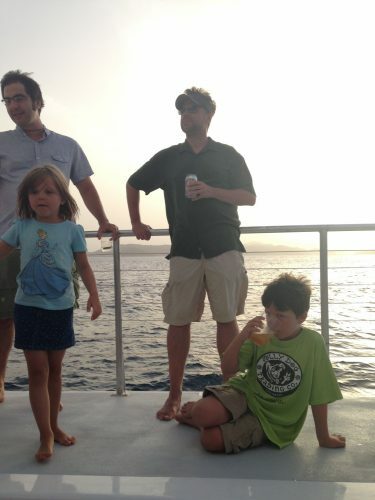 We loved Cruz Bay Watersports. They have many charters, sailing outings, snorkeling outings and other water sports to offer. Their day trip to the Baths are all day and they provide lunch, as well. Cruz Bay Watersports has great employees and crews and we had a very good experience with them. 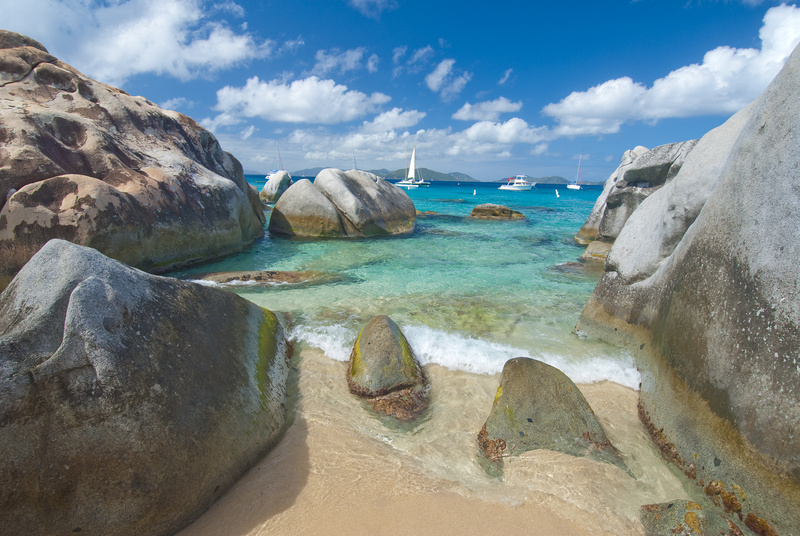 The trip to Virgin Gorda is beautiful and really fun for the whole family and the Baths are an experience not to be missed. The Baths themselves are huge groupings of boulders in shallow waters, providing lots of nooks and crannies to explore and relax in. 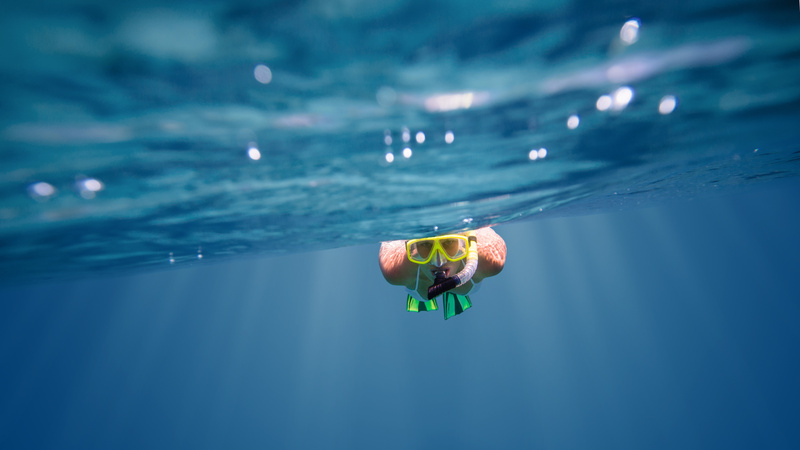 Cruz Bay Watersports will also provide snorkeling gear and floaties. The National Park Underwater Trail: St. John’s national park status extends into the sea. Two thirds of the island are a national Park and that includes the National Park Underwater Trail. The trail is 225 yards and located in Trunk Bay. There is a day fee for use of the beach and snorkeling gear can be rented on site if you do not have any. The trail is in very shallow waters and has signs underwater, pointing out coral types and fish types. This trail is perfect for novice snorkelers, such as children, because it is very well marked and in very shallow water. Chock full of sea fans, lots of coral and hilarious looking parrot fish, this trail enthralls kids of all ages. St. John has too many things to do and we couldn’t fit them all in! Not surprisingly, most of them focus on water and beaches, but there are also plenty of old sugar plantations and sugar mills to visit for he history buffs in your group. For a family with young children, history may not be the best choice however. We stuck pretty close to the beach and found that these 3 day trips on St. John was just enough for us, and still gave us plenty of relaxing beach time. We can’t wait to go back. Next up…..parasailing?